Steve Huffman is co-founder of reddit.com, a social news site and one of the largest communities online. Huffman created Reddit with his college roommate, Alexis Ohanian. 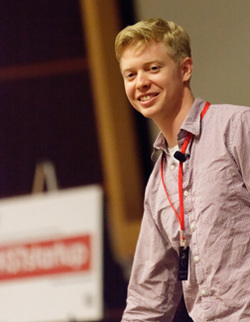 Reddit was initially funded by Y Combinator in 2005 and has grown to over 3 billion page-views per month. In October of 2006, Reddit was acquired by Conde NastPublications. In 2010, Huffman co-founded Hipmunk, a travel search site that aims to take the agony out of finding plane tickets and hotels online. Hipmunk has been named to Time Magazine's Top 50 Websites and Top 10 Smart-Phone Apps. Huffman was named to Inc. Magazine's 30 Under 30 in 2011 and Forbes 30 Under 30 in 2012. Huffman is a 2005 graduate of the University of Virginia (UVA). Huffman will present on Friday, March 22 from 2:30 p.m. - 3:45 p.m. in room 113 IST Building.